This t-shirt will show the world that you are not a nerd. OK maybe you are if you wear it but it is funny. On this t-shirt you can see a pair of glasses and around that the text “I’m Not A Nerd. I’m Just Smarter Than You”. And this funny nerd t-shirt comes in all kind of styles and colors for men and women. 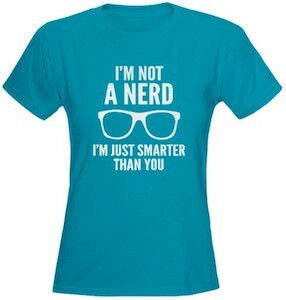 So if you want to show the world how smart you are then start wearing this I’m Not A Nerd. I’m Just Smarter Than You T-Shirt.